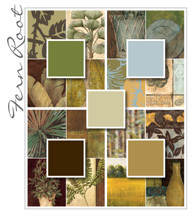 Fern Root is inspired by the earthy organic colors of nature. Mossy green, warm blue, and rich brown are natural fits in traditional or lodge design, but use of the color palette in reserved, clean ways allow for more contemporary applications as well. Gango Editions has a wealth of rich brown and green colors in the art collection featuring leaves, palm fronds, landscapes, and other natural elements. Fern Root allows the designer to create a natural preserve, a restful retreat from the busy industrial world.